Senior Scholarship | DEADLINE JANUARY 11, 2019! Up to five high school seniors will be chosen each year to receive $1000 each — One per school district. Please encourage your students to compete! FLENJ sponsors an annual statewide written and oral contest for high school seniors. Winners receive a $1000 scholarship for college. Teachers who are current members of FLENJ, and who renew for the next calendar year can nominate a high school senior to participate. Many high school seniors who enter are either at the Advanced Placement level, honors or advanced level of language study. First, in the essay portion of the competition, participating seniors are given writing prompts that require an interpretation of an illustration or a response to a situation in the target language. Click here for a sample of a past prompt. Based on performance on the essay portion, semi-finalists will be chosen to participate in the oral interview portion of the competition. These students will undergo an oral telephone interview in the target language. The averaged results of the essay and the oral interview will be used to rank the semi-finalists. Students are categorized as heritage or non-heritage speakers, and representatives of both groups will have the opportunity to be chosen for awards. World language teachers who are not current members of FLENJ and who wish to see their seniors compete must become members for the competition year before sending in their application form. In addition, all nominating teachers must renew their membership for the following calendar year, before sending in their application form. Up to five scholarships are awarded each year in the amount of $1000 each. Applicants must be seniors planning to attend college in September of the next calendar year. Applicants must be students in the world language in which they choose to compete. Applicants may compete in only one world language. Nominating teachers must be current members of FLENJ and they must renew for the next calendar year in order for their nominated students to be eligible. High school seniors must complete the application form. Nominating teachers must sign the application form. Guidance counselors should e-mail the application form to student_scholarships@ flenj.org. After the application deadline, the writing assignments will be e-mailed to the guidance counselors of all eligible applicants. All writing must be completed by hand and submitted as a PDF. Possible writing prompts include the description of a picture, writing on a given topic, or other. Applicants must do the writing by themselves under the supervision of their guidance counselor. Completed writing assignments are to be submitted digitally by e-mail by the guidance counselors to student_scholarships@flenj. org, by the deadline included with the writing assignment. Writing assignments submitted late will be disqualified. Writing assignments will be graded by a scholarship committee using a rubric. Semi-finalists will be contacted and given instructions concerning the oral component. The oral portion of the competition will take place over the telephone. Scores on the writing assignment and oral interview are averaged to determine the finalists. The confirmed winners will be notified. 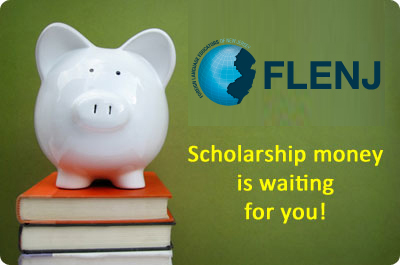 Awards are disbursed in June/July after copies of college acceptance letters are sent to the Chair of the FLENJ Scholarship Committee. Candidates who fail to submit college acceptance letters by June 30 in the year of receipt of their award will forfeit their scholarship. It is extremely important to fill out the application forms carefully. Our congratulations to the 2018 FLENJ Scholarship winners! The high school seniors in this year’s FLENJ Scholarship competition submitted essays in Spanish, French, Italian, German, Chinese, and Japanese. The students have studied a second language for an average of five years, an indication that the students have benefited from longer sequences of language study. Most of the students who achieved semi-finalist status reported using the language they have been studying outside the classroom in a variety of circumstances involving work, travel and social activities. The finalists from the essay part of the competition took part in an interview similar to ACTFL’s Modified Oral Proficiency Interview (MOPI). It was evident from their essays and their oral interviews that these students have achieved a high level of competence in their respective languages. These results provide additional evidence of the high levels of proficiency and communicative competence that can be attained after extended periods of language study. These students’ teachers and the districts and schools that have designed such quality programs should be commended. Click here to see some prompts used during the last few contest years. Click here to see a list of winners from past years.